Lady fingers are popularly known as boudoir biscuits,sponge biscuits,sponge fingers and so on.These are oval shaped long cookies (about 3").The cookies are made using a sponge cake batter where the egg yolks are beaten with sugar until thick and egg whites are folded in.By now,many of you have already guessed and are waiting for the tiramisu recipe because of my mascarpone cheese post.That's true,friends..I made these cookies to make tiramisu.Though these are available in stores,I just wished to know the texture of the homemade lady finger cookies and the effort in the making these.Have I gone crazy to try all these from scratch? Noooo..I wished to try out tiramisu from scratch since long,its just a matter of learning different things by adding an extra effort and baking is my weakness(love) in cooking.I wouldn't say you should bake these,but if you love baking, or you live in a place where there is no access to the store brought lady finger cookies and still you want to try these,then go ahead. I have adapted this recipe from here and as I was doing it for the first time,I didn't change any of the ingredients.The cookies were real sponge like and delicious.But after the bake I felt the odour of egg was prominent,so I would cut down the egg white to one next time or increase the vanilla flavor.Am not very good at piping,so with the shapes too. Pre heat oven to 350 degrees F and line a tray with parchment paper.Use a pencil and ruler to divide the parchment paper into 3*3 inch rows leaving a space of 1" in between.Make dark lines and turn the parchment paper upside down. (You can still see the lines as guide and pipe the cookies) Also,keep a pastry bag fitted with 1/2" round tip. ith your hand mixer,beat the egg yolk with one tbsp of sugar on high speed for 4 minutes or when the batter becomes thick ,pale yellow. (When you raise the mixer it should fall back as slow ribbon)Beat in the vanilla extract and sift the cake flour over the batter,don't fold in. In another clean bowl,whip the egg white until soft peaks form.Add in the granulated sugar (2tbsp) gradually and continue beating until stiff peaks form and whites are glossy. 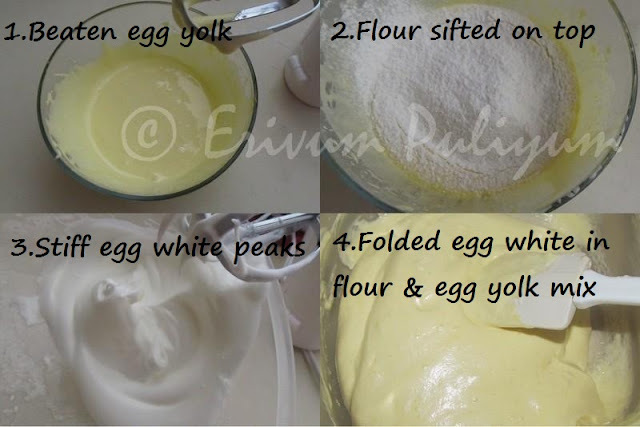 Fold the whites in the egg yolk and flour mixture,mix until just incorporated. 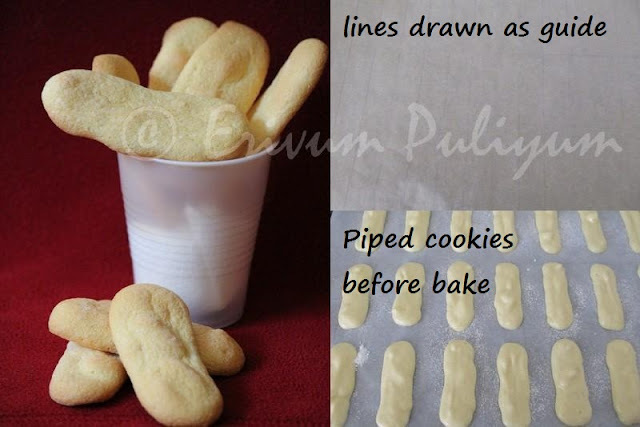 Transfer the batter to the piping bag,hold your bag 45 degrees angle to the parchment paper,start piping the cookies of 3" long using the drawn lines as guide.Leave a 1" space in between each cookie. When you have piped all cookies,sift the confectioners sugar using a wire/tea strainer. Remove from oven and slide the baking sheet over the wire rack to cook.when they are still warm,slide a spatula and release them from parchment paper.If you leave it long,it will stick to the parchement paper. Ready to use once cooled!! * If you are not using straight away,then you can freeze these cookies as they stale easily.Remains fresh for 2 weeks if placed in plastic bags between linings of wax paper or parchment paper. The remaining flavors and thoughts after soaking will be shared once I share tiramisu. Mascarpone done, sponge biscuits done.. looks like Tiramisu is gonna happen soon ! I won't believe that Baking is your weakness. You have done it vey perfectly. Waiting for your tiramisu post. first cheese now cookies , just assemble it and make tiramis. r u trying our patience level? i have not. Hi, Julie. We call these type of biscuits, "soletillas" or "Bizcochos de lengueta" as they seem a longue tongue. 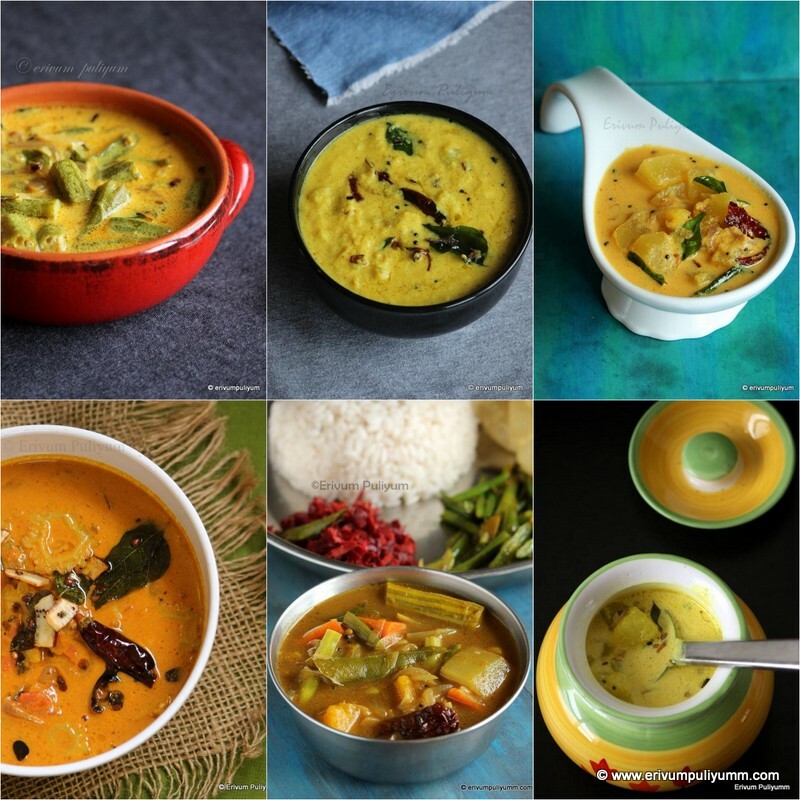 I copy your recipe because it's a bit different. Best regards! 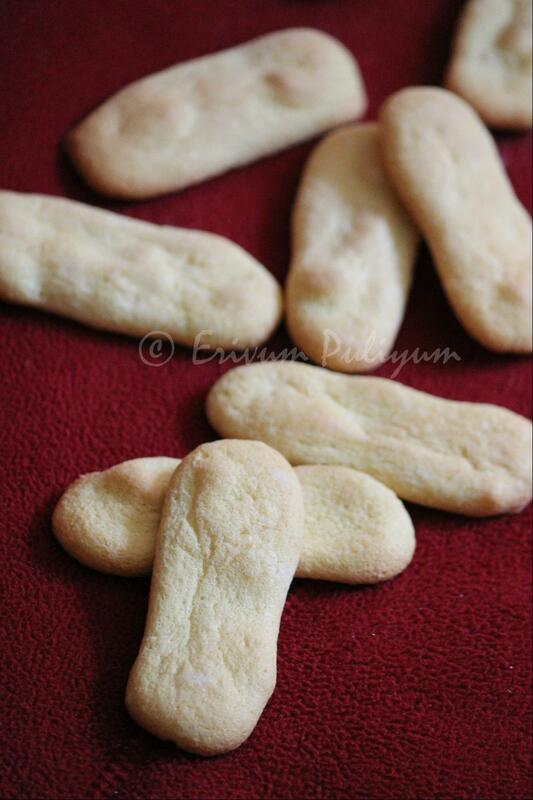 Lady finger cookies looks so yumm Julie.. Can we make it eggless ? Love this... Planning to try soon...Bookmarked! 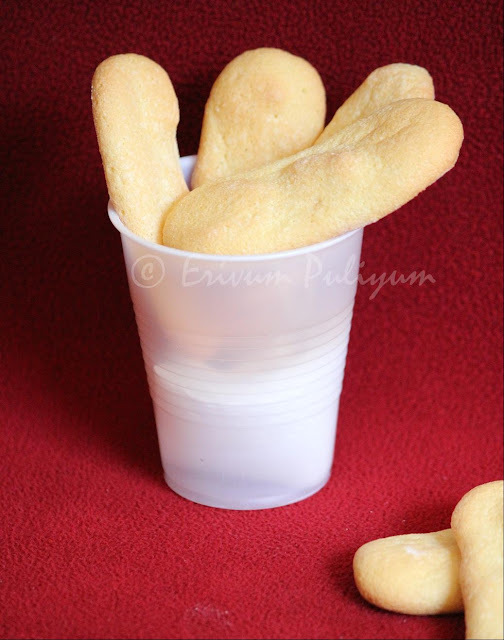 I love these cute lady fingers, usually the are made to decorate a cake... so is there a cake coming soon? These look Perfect Julie ! Making all the components of a Tiramisu from scratch indeed requires a good effort. I make them in a similar way...Much better and cheaper than bought-ones! 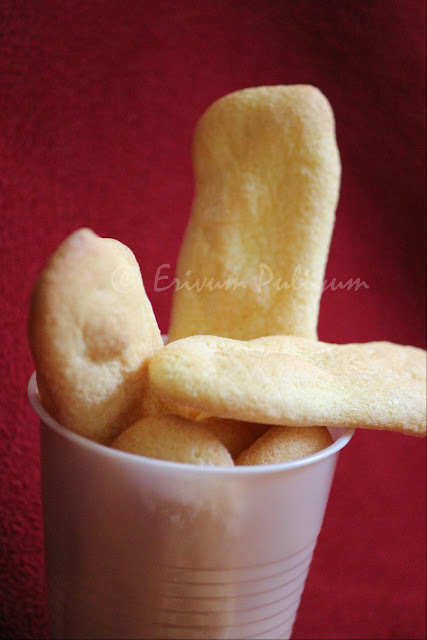 Cookies look really nice...great clicks. Beautiful work, Julie! 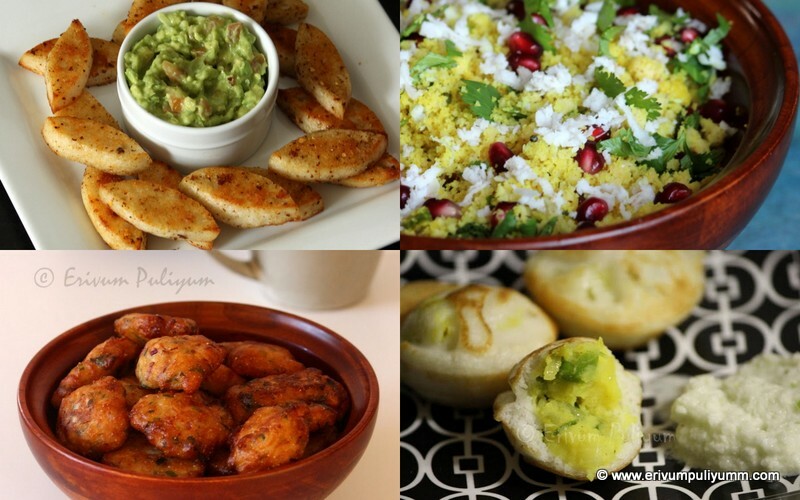 Cooking from scratch is so much better than store bought. These cookies look perfect! I had a terrible failure making them only few days back-they turned out flat! so maybe if i try again, I will use your method..they look authentic, Julie! Mail me this and mascarpone. I will make tiramisu! awesome. looks so cute...very inviting biscuits !! Wow Julie, I've always wanted to try making lady fingers...you've done a great job....Tiramisu ondakiyo? Can't wait to see. Will the next post be Tiramisu, Julie, looking forward to it..
That looks so good. 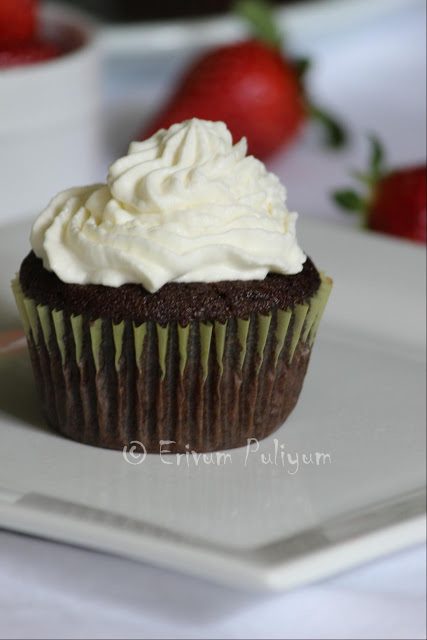 You would have made tiramasu with it - right? hi julie, is this like the savoardi italian finger biscuits?.. i use them to make tiramisu, which is my number one favorite cake... wil try. bookmark with thanks. the savioardi is difficult to find over here and very expensive too..
Wow.. Nice recipe & very inviting..
Lady finger looks delicious. Love it. May be you are going to Tiramisu. Awesome job done dear...looks better than store bought fingers..